Georgia Oak Tree. The roots tell the story of the working people, "These Are the Hands That Tll the Soil." The centered clasped hands symbolize Yin/Yang, feminine and masculine relationships of all types. Rejoicing hands waving in the air. The sun giving life and the moon sustaining life. 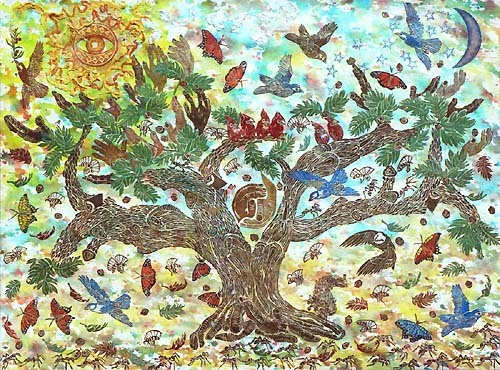 Ants and butterflies symbolize exodus and migration. The butterfly also symbolizes metamorphosis, life's developmental stages and change. Bees and seeds fertilize the earth with rebirth. The owl and squirrel depict the interdependence of the food chain, an ancient life and death saga. The flying birds express freedom, clean air and clean environment. One-of-a-kind woodblock print cut-outs, collaged on color ink background color field.